People flock from all across the Southeast to see fast cars compete in the O'Reilly Auto Parts Friday Night Drags at Atlanta Motor Speedway each week. Eighteen different division from highly modified muscle cars to grocery-getters to everything in between, drivers bring the speed to see who is fastest each night. Spectators and race fans were treated to the fastest cars to ever to take on the pit lane drag strip on Friday night. 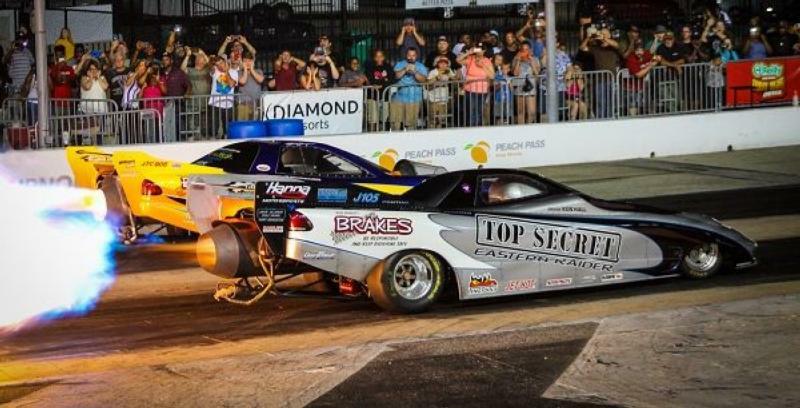 The Hanna Motorsports Jet Cars "Top Secret Eastern Raider" and "First Strike" wowed the crowd with a pair of exhibition races down the strip. "We love it. We pulled around the corner [onto the grid] and I saw the crowd and I was stoked," exclaimed Rich Hanna, driver of "First Strike". "We did a few extra fireballs, a few extra burner pops and try to give them that little extra show." The pair split the two exhibition races with the "Top Secret Eastern Raider" collecting the first win while "First Strike" extracted revenge in the second and final race between the two Jet Funny Cars at Atlanta Motor Speedway. "It's crazy, it's 4-Gs of acceleration off the line with 6,000 pounds of thrust and 4,000 horsepower," said Hanna. "With Jet cars in particular its tough getting parts for them, that's why they are so rare and that's why people like to see them because there aren't too many of them in the county." While the Jet Cars set track records ripping down the strip at breakneck speeds of more than 200 miles per hour in 3.9 seconds, the regular 18 different division battled for bragging rights and ever important points in the chase for a division championship. A Locust Grove showdown in the finals of the Summit Racing Equipment Sportsman Division saw Richard Cocoran snag his third victory of the season as he defeated the 1988 Chevrolet S10 of David Cobb in the final. "Stay in the pedal," said Cocoran about the key to his final round win. "Don't lift. I was all over dancing, but it worked out for me. My car has been running real good." Cocoran extended his points lead on David Waksman of Sharpsburg with the final round win as four points races remain in the season. Kevin Mayo of McDonough and his 1969 Chevrolet Nova earned his fifth win of the season in the QuikTrip Pro division to take control of the points race. Mayo knocked off the Ford of Dale Cosby of Ellenwood in the finals. Other notable winners included Robert Cheney of Jonesboro and his American Dragster in the Super Pro Division and the 1973 VW Bug of Rodney Bunn of Griffin in the Harbin's Mechanical Sportsman Division. Atlanta Motor Speedway's O'Reilly Auto Parts Friday Night Drags & Show-N-Shine returns to the pit lane drag strip next Friday, Aug. 3. Grandstand gates open at 6:30 p.m., and nightly drag race eliminations start just after 9:00 p.m.